Intravenous therapy (IV) is a common form of treatment used in hospitals or by carers to deliver medication, fluids or blood in a wide range of medical situations. Finding a vein is not always easy. An estimated 40% of IVs are missed on the first attempt, causing unnecessary pain, delay and skin trauma. The problem is worse among the most vulnerable – children, the elderly, and those with a very high body mass index (BMI). 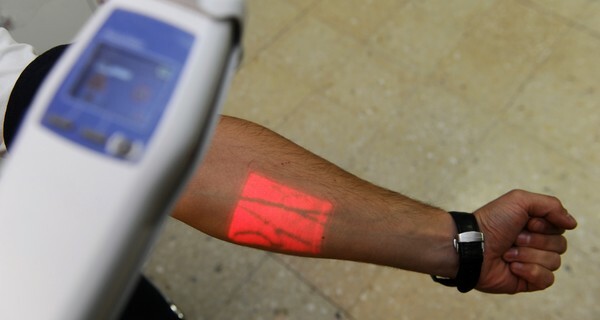 AccuVein, a handheld AR scanner, makes the process quick and easy by visualising patients’ veins on the skin’s surface. An infra-red laser scans the skin, and an algorithm processes the data to project images of the veins directly over the skin, allowing a carer or healthcare practitioner to target them more easily with an IV needle. The scanner weighs just 275 grams and can be used by anyone, with little training required. As it never touches the skin, it doesn’t require disinfection after use, and can be shared across hospital departments. AccuVein says that more than 10 million patients have benefitted from its use so far, and that the chance of finding a vein on the first attempt has increased 3.5 times. “Fewer attempts mean less pain for children and adults, less trauma and anxiety, which is a big thing especially because these patients tend to be long-term patients so they have a lot of needle sticks,” said Roni Hamilton, a nurse at Kidz First Children’s Hospital in New Zealand, who has been using AccuVein since 2016. Each AccuVein scanner currently costs over $5,000, but widespread uptake of the tech promises to make AR accessible for health practitioners around the world.